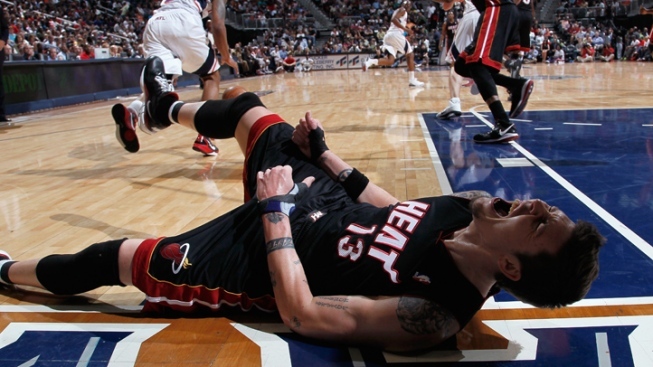 Could Mike Miller become a luxury tax casualty? With nearly the entire roster returning from their successful championship defense, the Miami Heat must consider whether to waive one of its high-priced reserves in order to lessen what could be a pricey luxury tax bill for the 2013-14 season. Backup guard Mike Miller and center Joel Anthony are considered to be possible amnesty targets should Miami opt to make this move. Miller is due to make $6.2 million next season, while Anthony will earn $3.8 million. Under the NBA's collective bargaining agreement, teams can use a one-time amnesty provision to waive any player within a specified window of time and not have their salary count against the salary cap or luxury tax. The window to amnesty players this offseason is between Thursday and July 17. They would still have to pay that player, but for the Heat such a move could result in significant luxury tax savings. Having re-signed Chris "Birdman" Andersen Wednesday, Miami's 2013-14 payroll stands at $87.3 million (not counting Jarvis Varnado's non-guaranteed contract). The NBA set its luxury tax threshold at $71.758 million on Tuesday night, meaning the Heat are almost $16 million above the threshold. Under a new escalating luxury tax clause, for every dollar a team is above the salary cap, they will have to pay a tax ranging from $1.50 to $4.25 (the old tax was calculated on a $1-to-$1 ratio). It is estimated that Miami's current payroll would bring a luxury tax bill of $33 million, just over a third of its payroll (Under last season's less punitive tax, the Heat paid only $13.3 million, second most in the NBA). Amnestying Miller would save nearly $17 million in tax money, according to an estimate from ESPN.com. In his season-ending press conference after the NBA Finals, Riley said he was reluctant to waive Miller. "He's a great player," Riley said. "So unless I get a mandate about (amnesty), we haven't talked about it. We just want to keep this team together." Miller appeared in 59 games last season, shooting 42% from three-point range. The Heat scored 1.17 points per possession while Miller was on the court (the league average was 1.06 points per possession). Miller has proven his worth on the court time and again, and Riley and coach Erik Spoelstra both prefer to have a bench deep with three-point shooters, but the economic reality of the NBA might force Miami's hand.